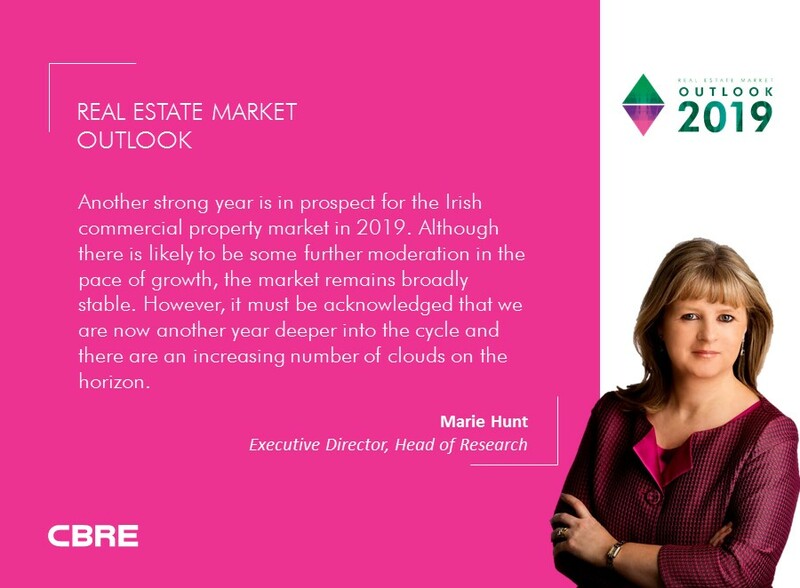 The CBRE Ireland Real Estate Market Outlook 2019 report provides insight on the key trends our experts think will affect the Irish property industry over the next 12 months. 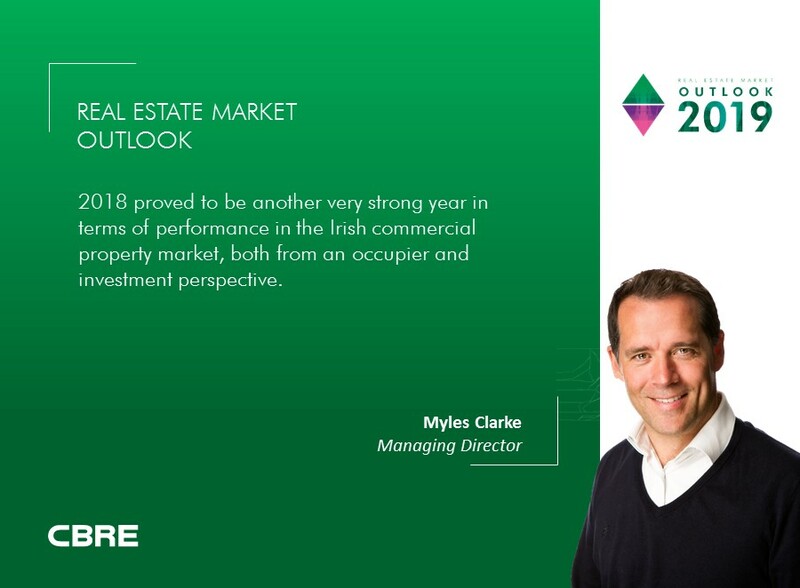 "2018 proved to be another very strong year in terms of performance in the Irish commercial property market, both from an occupier and investment perspective." "Another strong year is in prospect for the Irish commercial property market in 2019. Although there is likely to be some further moderation in the pace of growth, the market remains broadly stable. However, it must be acknowledged that we are now another year deeper into the cycle and there are an increasing number of clouds on the horizon." While the long-term sustainability of office demand is never certain, considering the volume of outstanding requirements for office accommodation in Dublin at this juncture, office take-up in the Irish capital is on course for another strong performance this year with supply expected to remain tight. On the basis that lettings have been secured on several of the industrial buildings that have recently been developed or are in the process of being developed speculatively in the Dublin market, take-up in 2019 is likely to continue to be relatively constrained as a result. We expect this will encourage some developers to proceed with additional phases of development during 2019. Metrics including footfall, retail sales and consumer sentiment were all relatively positive in 2018. There was also good activity in the retail property market with healthy volumes of transactions recorded despite shortages of stock in some prime locations. We are expecting investment spend in 2019 to be broadly similar to last year, led for the most part by some large office transactions. 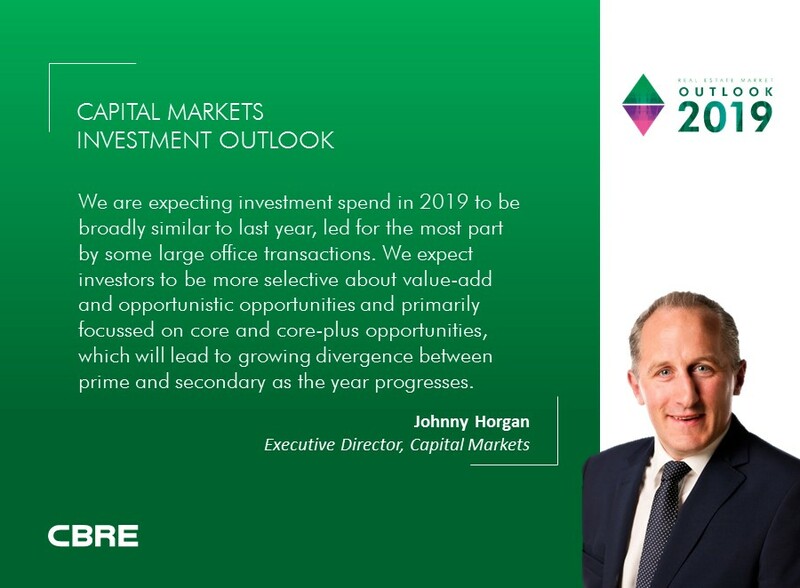 We expect investors to be more selective about value-add and opportunistic opportunities and primarily focussed on core and core-plus opportunities, which will lead to growing divergence between prime and secondary as the year progresses. As 2019 commences, there is still a very strong volume of capital to be deployed into the development land sector, which is encouraging. 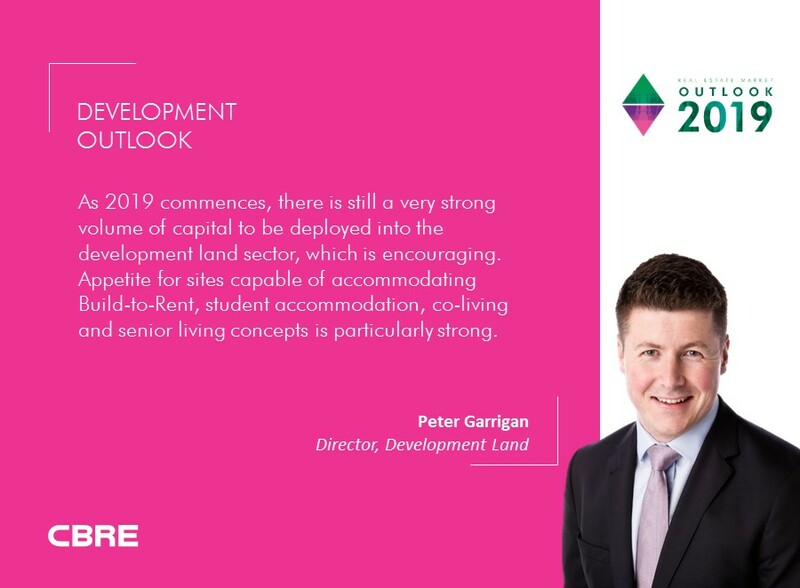 Appetite for sites capable of accommodating Build-to-Rent, student accommodation, co-living and senior living concepts is particularly strong. 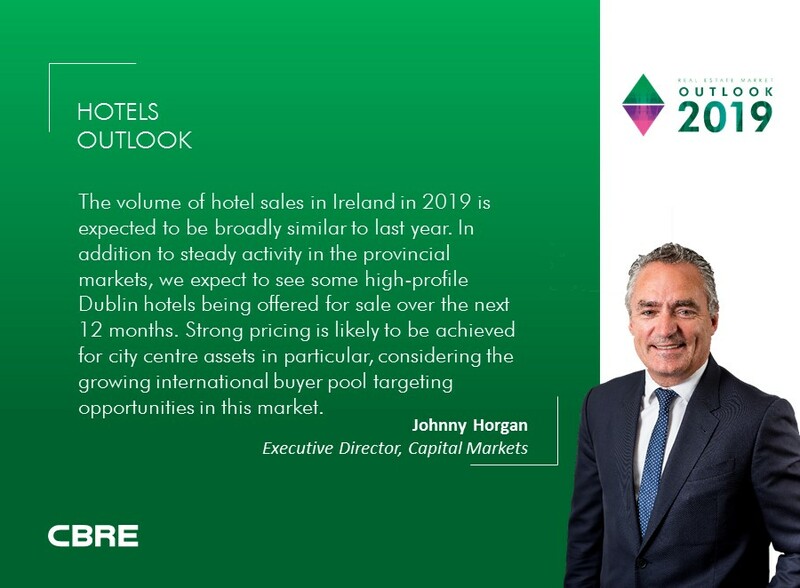 The volume of hotel sales in Ireland in 2019 is expected to be broadly similar to last year. In addition to steady activity in the provincial markets, we expect to see some high-profile Dublin hotels being offered for sale over the next 12 months. Strong pricing is likely to be achieved for city centre assets in particular, considering the growing international buyer pool targeting opportunities in this market. We expect to see up to 30 Dublin pubs coming to the market in 2019. In addition to some city centre premises, a number of well-known suburban pubs are due to be formally launched for sale. As was the case last year, we expect to see several pubs changing hands for alternative uses this year. A wider pool of investors is now willing to look at opportunities in Cork including several European institutional investors. We could see more new entrants in 2019 in addition to some of the existing investors deploying more capital in the region.